Make the veggie burgers: Bring 1 cup water to a boil in a small saucepan. Add the quinoa, cover and reduce the heat to low. Cook until the water is absorbed, 15 to 20 minutes. Remove the quinoa from the saucepan and spread out onto a baking sheet. Cool completely. Meanwhile, puree half of the cannellini beans in a food processor. Combine 1/4 cup of the cooked quinoa (save the rest for another time), the cannellini puree, the remaining whole cannellini beans, the corn, panko, cilantro, chili powder, cumin, granulated garlic, 1/2 teaspoon each salt and pepper, and the lemon juice in a large bowl. Stir until the mixture comes together. Form into 8 small patties; place on a plate and refrigerate for 15 minutes to firm up. Meanwhile, make the yogurt sauce: Mix the cucumber, yogurt, lemon juice, tahini, sugar and garlic in a small bowl. Season with hot sauce, salt and pepper. Set aside. Cook the veggie burgers: Heat the olive oil in a large nonstick skillet over medium heat. Add the patties and cook until golden brown, 5 to 8 minutes per side. 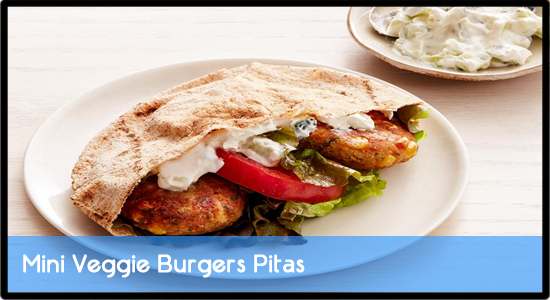 For the sandwich build: Place 2 patties inside each pita half; top with some lettuce, tomato and the yogurt sauce. Serve while on the elliptical machine.